Luís Filipe Madeira Caeiro Figo is a Portuguese former international footballer. He played as amidfielder for Sporting CP, FC Barcelona, Real Madrid, and Internazionale. Figo began his career as a street footballer at U.F.C. Os Pastilhas, before joining Sporting Lisbon at the age of 11. Figo started his career at Sporting CP. He won his first senior international cap in 1991. It was with Barcelona from 1995 that his career really took off: Figo won a UEFA Cup Winners' Cup in 1996–97, successive Primera División titles and went on to appear 172 times for Barcelona, scoring 30 goals. In 2000, Figo made a hugely controversial move to Barcelona's bitter rivals Real Madrid. 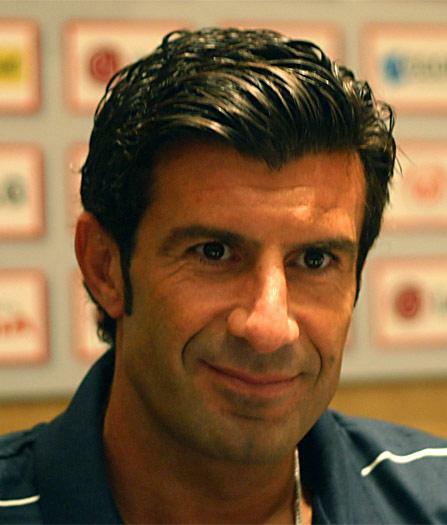 Figo's arrival signaled the beginning of Florentino Pérez's "Galáctico era". With Madrid Figo won La Liga in 2001 and 2003 as well as the 2001-02 Champions League. Figo left Real Madrid to join Internazionale in the summer of 2005 on a free transfer after his contract with Real Madrid had expired. His final game for the club was on 31 May against Atalanta at the San Siro. he freekick he scored in extra time against Roma during the Supercoppa Italiana was undisputedly his most memorable part of his time in Italy. He had a successful career highlighted by several trophy wins, including the Portuguese Cup, four La Liga titles, two Spanish Cups, three Spanish Super Cups, one UEFA Champions League title, one UEFA Cup Winners' Cup, two UEFA Super Cups, one Intercontinental Cup, four Serie A titles, oneItalian Cup and three Italian Super Cups. 5 players who betrayed their managers?